Number Of Police Officers Killed By Gunfire Fell 14 Percent In 2015, Study Says : The Two-Way Of the 124 officers who died, the largest number (52) were killed in traffic-related incidents, according to the National Law Enforcement Officers Memorial Fund. Another 42 were shot and killed. Mourners gather for the funeral of Harris County Deputy Darren Goforth, killed as he pumped gas in a surprise attack in August. According to new national statistics, 42 police officers were shot and killed in 2015. Four percent more law enforcement officers at the federal state, territorial and local levels died in the line of duty in 2015 than in 2014, according to a preliminary report from the National Law Enforcement Officers Memorial Fund. But despite several high-profile shootings of police in 2015, the group also says more officers died in traffic-related events (52) than from gunfire (42). The number of police officers killed by gunfire fell 14 percent from the 49 who were shot and killed in 2014. Seven of those shootings followed traffic stops; six were surprise attacks on officers, such as the Aug. 29 slaying of sheriff's Deputy Darren Goforth at a gas station in suburban Houston. The 2015 figures released Tuesday are in rough proportion to recent annual reports from the nonprofit NLEOMF, which says that in 15 of the past 20 years, traffic-related incidents have been the leading cause of death for officers killed in the line of duty. Speaking to NPR's Carrie Johnson for a report on today's All Things Considered, NLEOMF Chairman and CEO Craig W. Floyd says that while police agencies are trying to work around tight budgets to train officers on driving at high speeds, the public can also help. "Move over and slow down when you see an emergency vehicle on the side of the roadway," Floyd says, adding that "11 officers this year were struck and killed by motorists who did not slow down, who did not move over." Since hitting a peak in the early 1970s with 280 deaths, the number of officer fatalities in the U.S. has been falling. Of the gunfire that killed officers in 2015, the NLEOMF says those 42 deaths "are 26 percent lower than the average of 57 per year for the decade spanning 2000-2009." "This nation of ours is a nation of guns. It's a right that people have and we honor that right. But at the same time, too many criminals are using guns illegally to commit violent acts, not only against the citizenry but also against the law enforcement professionals who have to go out and keep our communities safe." The release of the 2015 figures comes as police shootings and tactics face new scrutiny in Chicago, Ferguson, Mo., Cleveland and elsewhere — particularly in cases involving minorities. National figures on the number of Americans who are shot and killed by police aren't compiled by the government; The Washington Post reports that nationwide, police shot and killed 977 people this year, and that of those killed, 37 were black and unarmed, representing less than 4 percent of the total. The Post reports, "the great majority of people who died at the hands of the police fit at least one of three categories: they were wielding weapons, they were suicidal or mentally troubled, or they ran when officers told them to halt." In addition to the 94 officers in the NLEOMF we mentioned above, another 30 died of other causes in 2015, including 24 who suffered heart attacks and other illnesses deemed to be job-related by the memorial fund. Also included: one officer who drowned, and another who was beaten to death. 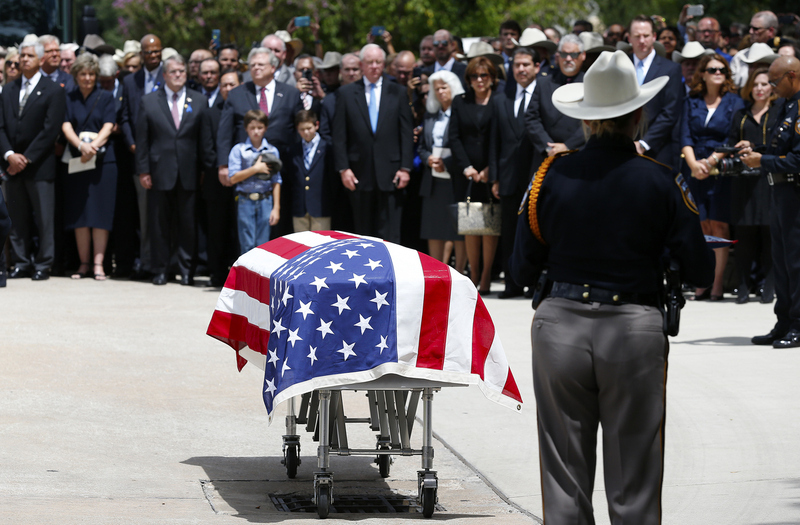 "Texas had the highest number of fatalities, losing 12 officers in 2015. Eleven officers died in Georgia, nine in Louisiana, and six in both California and New York. Thirty-three states lost at least once officer this year. Seventeen states and the District of Columbia did not lose an officer in 2015."